This bed frame without slats is great because it adjusts to different bed sizes when needed. 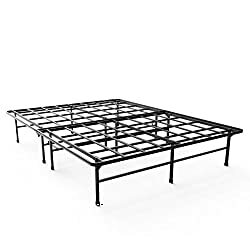 In addition to being adjustable, this bed frame is made of steel and has extra support. The dimensions of this bed frame are 53.5 x 70.5 x 7 inches and it weighs 23 pounds, so it makes for easy transportation. This bed frame without slats is great because it requires no box spring or foundation under the mattress placement. Additionally, there is extra hidden storage space under the bed frame if needed. The frame also weighs only 115 pounds, so this makes for easy transportation. This bed frame without slats is amazing because it comes as a complete set, which makes for no required assembly and easy transportation. This bed frame also only weighs 27 pounds, so that makes for easy transportation as well. This bed frame without slats is perfect because it is hardwood and has a modern-style that fits with any color theme for a bedroom. The plank headboard adds to the modern look and allows for any style furniture to look well with it. This bed frame without slats is great because it is inspired by a traditional modern style furniture and is coated with a dark oak finish. This allows the bed frame to go well with any type of furniture. Although slat-supported bed frames offer support where needed to the mattress, the bed frames that contain no slats allow for more even support throughout to the whole mattress giving more comfort. If you own a softer mattress like the foam, air, or memory mattress, then bed frames that contain no slat-supports are more beneficial to you. However, there are major downsides to having a slat-supported bed frame while also owning a foamed mattress. 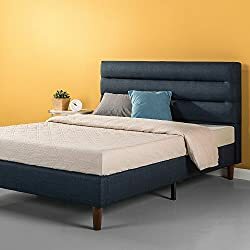 Since most people prefer to own foam or memory foam mattresses like the Purple Mattress, having a slatted bed frame base can and will cause problems to both your mattress and your sleep. 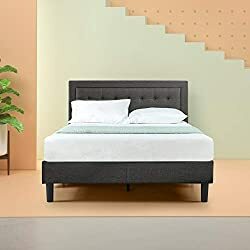 The memory foam and softer mattresses can push between the slats of the bed frame base and this affects both the life and quality of the mattress. Because of this, most people should consider purchasing a platform or plywood base bed frame if they own a form/memory mattress.